The story begins in November 2001 when singer Sarah Jezebel Deva (Cradle Of Filth, Therion, Mortiis etc), and composer Chris Rehn (Abyssos) met each other on a mutual tour. They soon became good friends and discovered they both had the same ideas about working with a completely orchestral project, which lead to them starting to work together. 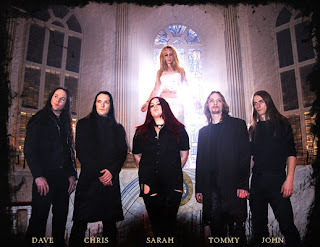 Chris composed the songs and Sarah wrote the lyrics and in november 2002 they recorded a 5 track demo at Virtual Symphony Studios in Sundsvall/Sweden, owned by Chris´brother Tommy. In association with MtGrave Art and Graphics they produced a limited edition exclusive dvd box packaging for the demo to send out to record labels and press only. They got nothing but great respons all around the world, but finding the right record label interested in investing in them turned out to be very difficult since all their combined connections lay within the metal scene. They had to search from outside their connections in to for them unknown territory, which made the task very difficult. Chris and Sarah started talking about forming a band together. A band that would be in the same orchestral movie score atmosphere, but more focused towards metal and with a proper line up to be able to tour. So the two decided to start working on that project along side with their orchestral project. Chris wrote the songs and Sarah wrote the lyrics for a new demo. Chris recorded the songs once again at Virtual Symphony Studios, this time in association with his brother Tommy, and in early july 2004 Sarah went back to Sweden to record the vocals. During the recording Chris asked his brother Tommy to join the band, and Angtoria was born.. They sent out demos to record labels and press, and interest for the new formed band grew quickly resulting in several top rated reviews, awards and interviews for magazines all over the world. In July 2005 they signed an exclusive management deal with Fortress Music And Artist Development to represent Angtoria in their search for a record deal. In november 2005, as a result of their partnership with Fortress Music And Artist Management, they signed a record deal with french renouned metal label Listenable Records. In november 2005 they started recording their debut album entitled "God Has A Plan For Us All" at Sidelake Studios Sundsvall in Sweden. For the recording they hired young and upcoming very talented drummer Andreas Brobjer to handle the drums for the album. To help out with the initial drum setup they worked with renouned producer, engineer and technician Daniel Bergstrand (In Flames, Soilwork, Strapping Young Lad, Behemoth, Meshuggah etc) who they also hired to help out in the initial stage of the mix. Guest apperances from Dave Pybus (Cradle Of Filth), Aaron Stainthorpe (My Dying Bride), Rikard Andersson (Space Odyssey, Majestic, Time Requiem), Martin Häggström (Moahni Moahna/Zool can be found on the album which was released in the end of april 2006 on Listenable Records. To further help promote the album they recorded a video for the title track "God Has A Plan For Us All" with upcoming and very talented director Måns Berthas and his crew in the end of april 2006.